One of my favorite topics of discussion is prospecting. I am fascinated when a salesrep will tell me they have a great offering and they know exactly whom to call and what to say. Their enthusiasm is a major plus and confidence is essential, but their focus is just far too narrow. The proverbial ‘bull in a china shop’ prospecting mentality just doesn’t work anymore. End users are too savvy for it. Here are some of the best prospecting tips that I feel will help you understand what I like to call…. 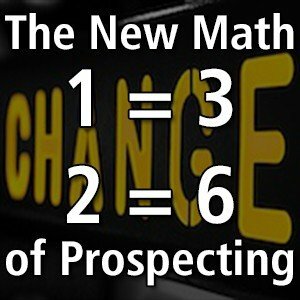 Every salesrep must learn the New Math of Prospecting: 1 = 3, 2 = 6. Required to meet and exceed quota and other performance goals. What exactly does 1 = 3 mean? If you are planning to discuss 1 offering, expand it to 3. If you are planning to contact 1 executive at a firm, expand it to 3 as well. It took you so long to gain access to a person of significance, why penalize yourself by addressing only one topic and being satisfied with one person? Why not leverage your knowledge, your skills, your time, and the broad range of offerings and services your company brings to market? Take your best prospecting methods and combine them into the single call instead of being a one trick pony. A. If you are targeting an Owner or President, why not also the CFO, Director of Sales/Marketing, IT director, and the VP of Operations as well. Each needs the offering from a different perspective but they all work for the same bottom line. Tell them you are contacting multiple executives since each has a different set if priorities and the beauty of your offering is that it can benefit so many diverse lines of business and responsibilities. When You never know when an in-company referral can be provided. This is the entire point of prospecting for new customers, getting that foot in the door with influencers who can help get you to the right person. B. If you call executives focused on one offering or solution, if they are not interested the call may be over in an instant. But if you speak of an array of offerings and services, the likelihood of interest and next steps increases exponentially. Sales Prospecting: 1 executive = 3. One offering = 3. A total of 9 ways (3 x 3) to strike interest at a given enterprise. You can be increasing your time efficiency and batting average simultaneously. It’s the New Math of Prospecting, and with practice becomes a flawless part of your arsenal.